Two top British producers, Charlie Parsons and Lord Waheed Alli have created a campaign website called âgreatbbcâ to help prevent the BBC from being destroyed by the current Charter Review process. They’ve create a video featuring a number of well know celebrities. Change your profile picture to show your support: either with our campaign graphics or with your own creation! 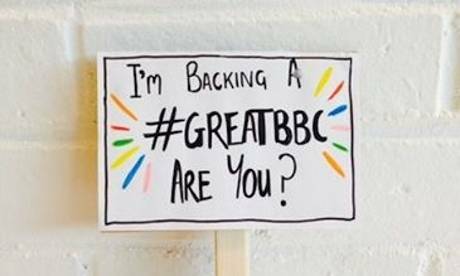 If you’re inspired, make up your own supporting message/ visual/ gif and share it on Instagram or Twitter using #GreatBBC (and don’t forget to mention @great_bbc so we can see your creation) and/or use it as your social profile picture! You are joking. Nick Robinson has changed sides. The BBC need to do something as the likes of Netflix will just make them redundant. Their UK TV programming is really losing ground in interest compared to shows in the USA. UKTVlover: Just how many people watch Netflix at 630pm on a Saturday night, and how many watch BBC1/Iplayer at the same time? Streaming sites are taking up more viewing time, but we still watch most TV live, and for a lot of people, their internet speed is barely up to watching anything in SD.